1. I used Schwarzkopf Gliss™ Fiber Therapy Shampoo and Conditioner FAITHFULLY!!! You can literally feel your hair getting stronger every time you wash it! 2. 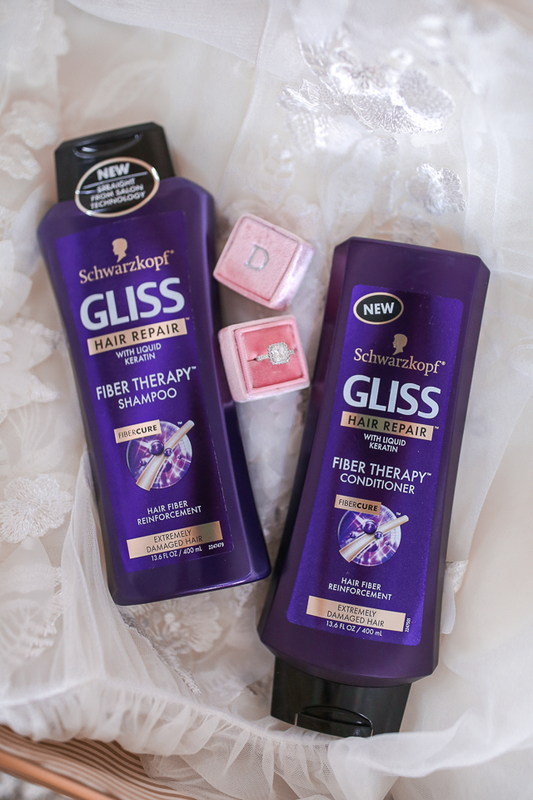 I applied Gliss Fiber Therapy Repair-In-Oil Spray to my hair after getting out of the shower a few times per month. If I knew I was going to wash my hair in the morning, sometimes I would spray my hair and put it in a bun right before getting into bed. 4. During workouts, I braided my hair so that it didn’t get damaged from a tight ponytail. 5. When I could, I let my hair dry naturally, and used my curling wand as little as possible. Now for my wedding hairstyle! 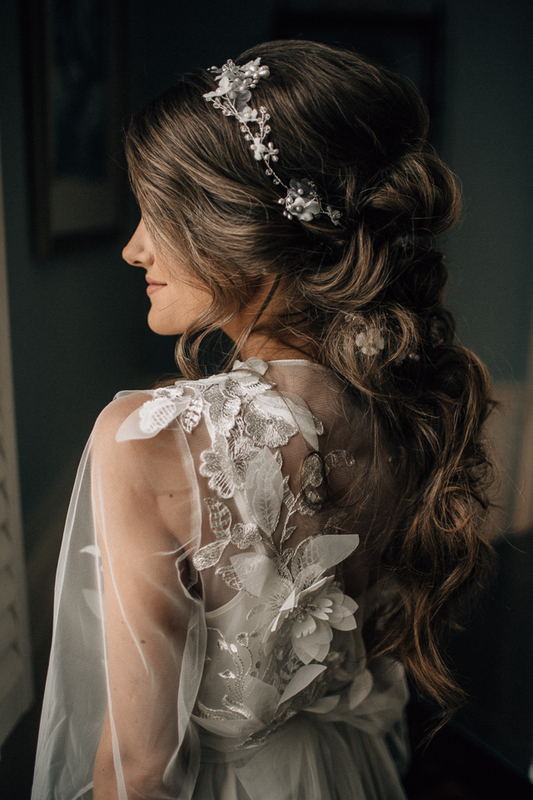 I knew I wanted a different wedding hairstyle… something romantic and a little boho. I envisioned lots of curls and loose tendrils, I didn’t want a hairstyle that was “perfect” with every hair in place. 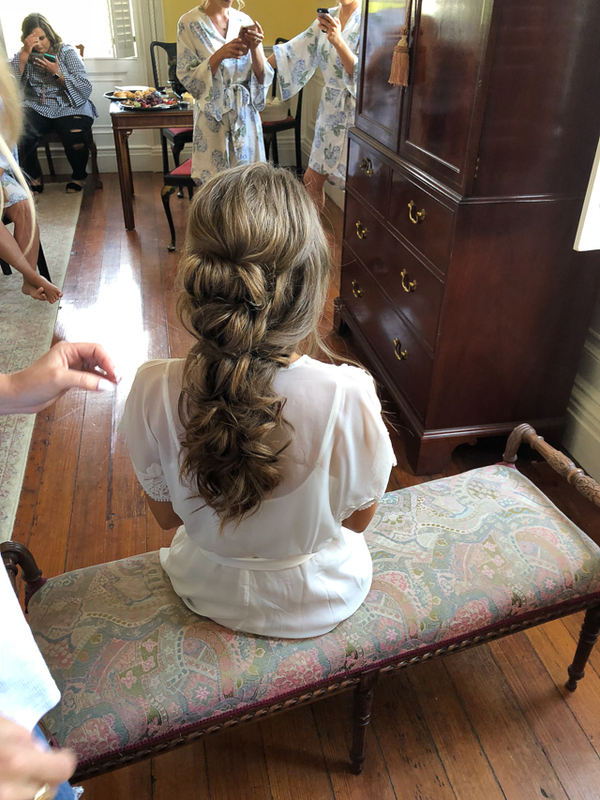 I also knew that I wanted a partial updo – the Charleston heat and humidity can be pretty fierce, so I wanted a hairstyle that kept me cool, but also still looked like “me” (and I normally wear my hair down!). I gathered a ton of inspiration from Ulyana Aster’s Instagram page, and asked my stylist (Charlotte Belk) to create something similar. She then ran her fingers through the curls to create loose waves. P.S. I love this picture because of all my pretty bridesmaids in the back!! Using tons and tons of bobby pins, Charlotte pinned small sections of hair to create this beautiful boho-style look. 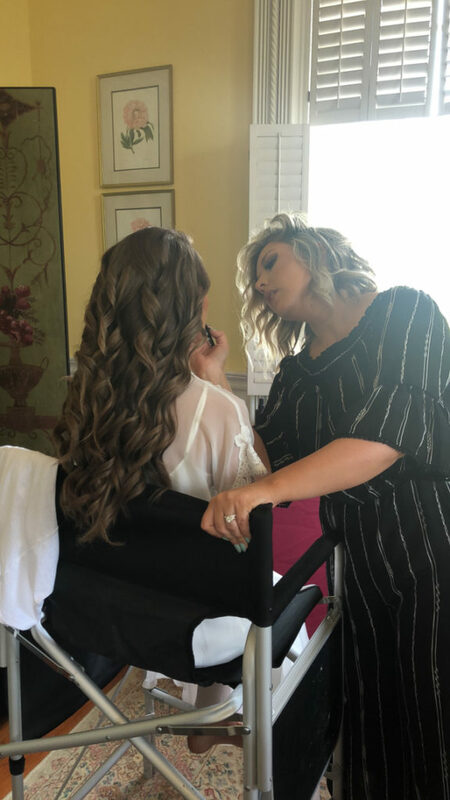 Before we started, I had given her a few instructions: I wanted lots of volume on top, and I wanted my hair to still look thick at the bottom, rather than looking like a braid where it thins out at the bottom. I think she did an amazing job capturing my vision! Next, she secured the headpiece (I had bought this one from Ulyana’s site six months in advance). She wrapped it around my temple and wove it through the hairstyle, securing it with bobby pins along the way. And THIS was the final product! I actually had more videos than pictures on my phone, if you guys want me to share them on Instastories or compile them into a YouTube video, let me know in the comments. The videos help to show the process of how Charlotte achieved this hairstyle. Overall, I am so so so happy with how my hair turned out! It was everything I had ever dreamed of, and on top of that, it stayed put the ENTIRE night! Even after a solid two hours of dancing, haha! 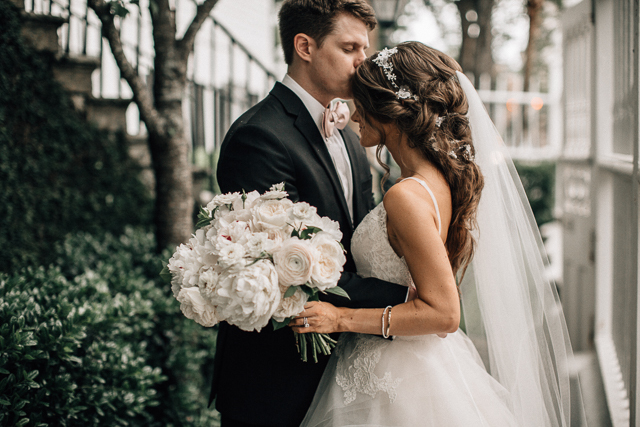 If you’re getting married in the Charleston area, I highly recommend Charlotte Belk. AND if you’re looking to whip your hair into shape, I highly recommend Gliss products! I truly credit them for transforming my hair and making it healthier and shinier than it ever has been for my wedding day. I would love to see the videos! Please put them in a video! Also- could you link your beautiful robe that you wore while getting ready?! It is GORGEOUS! Did you use any extensions for this beautiful style? Hey Kelsey, Yes she actually did put a few wafts (if that is the right word?!) of clip-in extensions in for this look, mainly to create more fullness at the bottom! I had never worn any extensions before so I'm not even sure what the brand is! But they were great! Your hair looks absolutely incredible Cait, wow!! 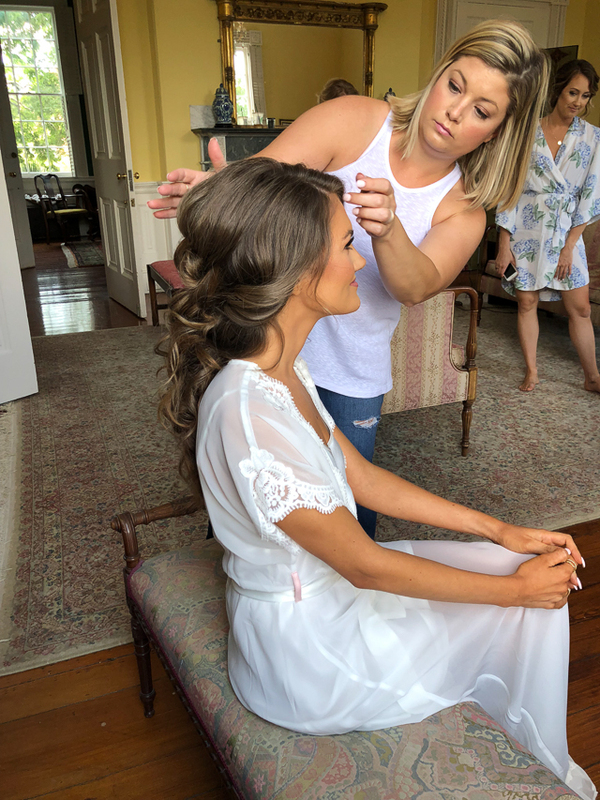 What curling wand did she use on your wedding day? 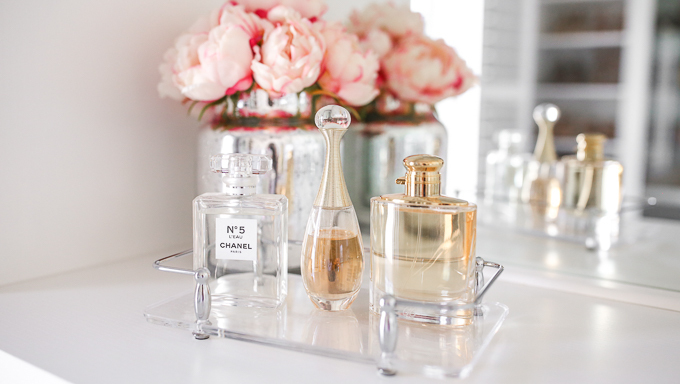 Do you know where that adorable ring box is from? Your hair looked beautiful!! I actually did my own hair at my wedding, so I didn't have a trial – but your tips are great. I also think it's a great idea to braid hair during a workout! http://trendkeeper.me .. How to deal with gaining weight! 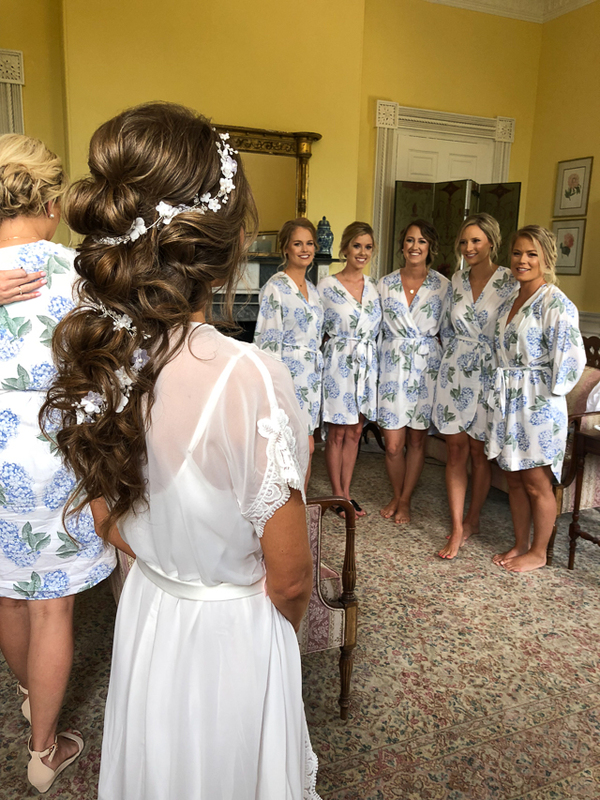 Would you be able to share where you found your robe and your bridesmaid's robes? Your hair looked lovely and I love these wedding pictures! Can't wait to seee/read more about the big day!! 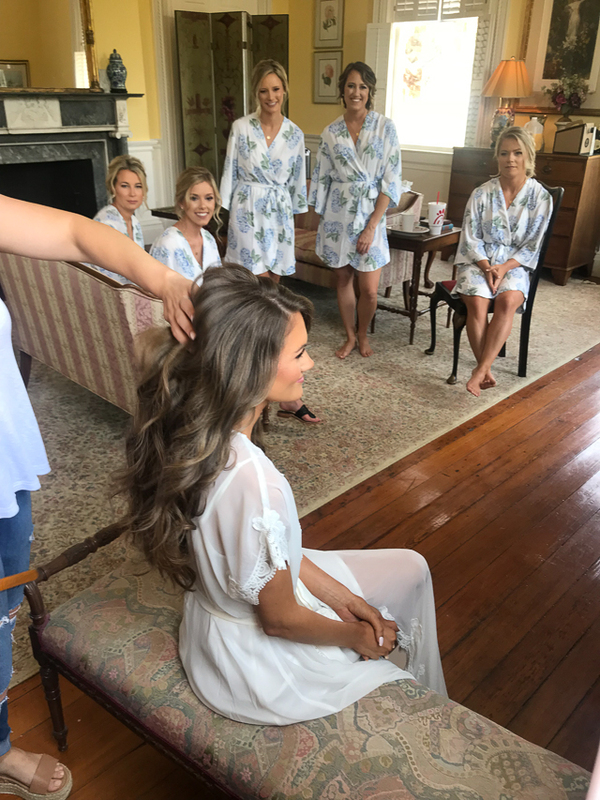 Your wedding hair was seriously amazing!! 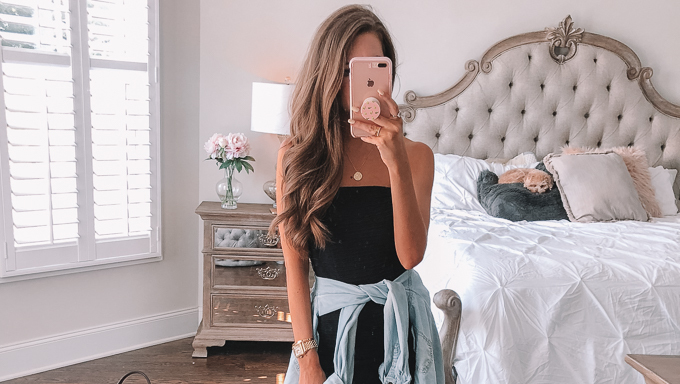 where's your top/dress/robe from in the first picture? It looks beautiful. This is exactly what I have been envisioning for my wedding hair!! This whole time I've been waiting for you to post your hair deets!lol This makes me so excited! You looked sooo gorgeous on your wedding day too! 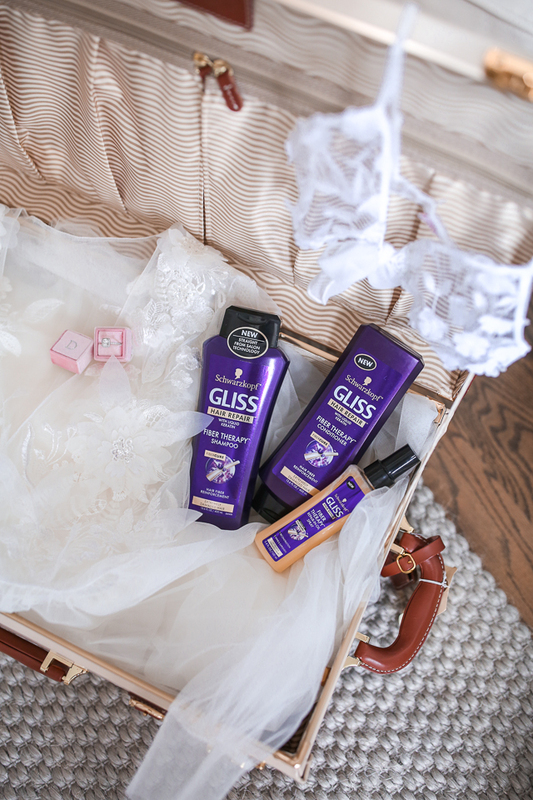 Thank you for sharing your beauty tips and wedding day advice! So pretty! 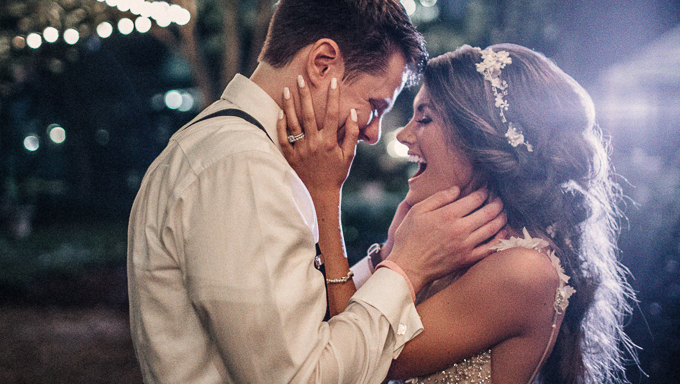 I love the look, such beautiful wedding pictures! Beyond lovely! Can't wait for more pics! Were you satisfied with the quality of your Ulyana Aster headpiece? How did it compare to other brands you tried? I have been eyeing the "Maria" but the no return policy makes me nervous. It is actually cheaper than a similar one I've tried at a Charlotte bridal boutique but I don't want to be out $130 if I don't like it in person. I would definitely love to see the videos and these photos are gorgeous!! The same thing happened to me at my trial. I had a vision in my head and when we did it, it looked okay but good thing I had pics taken because I did not like the way it looked in photos so I’m changing it around. Few more weeks left for me! So beautiful! Please make it into a video! Would love to show my stylist for my wedding this fall! Could you please share where you got your robe? I’m getting married in 2 months and have been struggling to find a beautiful robe to get ready in. Thanks!! I have search all over your blog for where it says what robe you wore getting ready for your wedding?! Can you send me a link with the blog post??? Thank you!! Where is that robe from??? I love all the flowers on it. I need it for my wedding. I absolutely love your robe from the first picture! Is there a link for that one too? Absolutely love the sheer robe you have on in the first picture! Do you have a link for that one?! 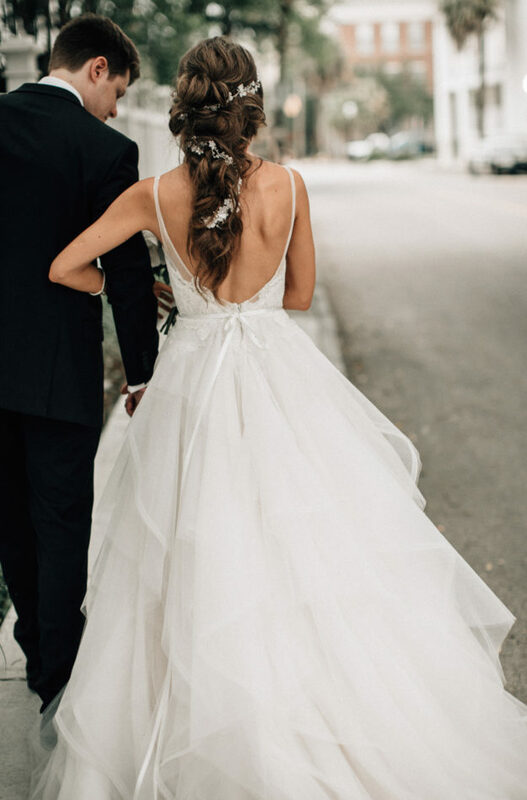 Will you please post videos on how she did your wedding hair ? Where are your robes from? Hello! Where is your robe from (the robe in the cover picture for this post)?